Abstract: A team of fire scientists and fire control personnel began work on the National Fire Danger Rating System in 1959, and tested the partially-developed system throughout the United States. The system, which sought to determine the probability of forest fire, became fully operational in 1972. The collection includes memoranda and correspondence among fire researchers and fire control personnel, as well as scientific work product documents such as data tables, graphs, charts, maps, fire danger rating devices, and research project documentation, ranging in date from 1911 to 2004. The materials in the collection document the process by which John Keetch and other research scientists combined regionally specific criteria for fire danger rating into a nationally applicable fire danger rating system. Later materials, created and collected by Dale D. Wade, reflect the subsequent shift in research priorities of the next generation of fire control scientists, from fire predictability toward studies in prescribed burning, air quality, and fire weather. Following H.T. Gisborne's invention of the first Fire Danger Meter in 1939, eight distinct fire prediction systems were in use across the United States. Fire researchers recognized the need for a national system to determine the probability of forest fire. A team of fire scientists and fire control personnel, including field researcher John J. Keetch, began work on the National Fire Danger Rating System in 1959, and tested the partially-developed system throughout the United States. The system became fully operational in 1972. After development of the national system, research priorities of the next generation of fire control scientists, such as Dale D. Wade, shifted away from fire predictability toward studies in prescribed burning, air quality, and fire weather. 1. Fire Danger Bound Volumes, 1952-1964. "1952 Forest Fires and Fire Danger In..."
"1953 Forest Fires and Fire Danger In..."
"1954 Forest Fires and Fire Danger In..."
"1955 Forest Fires and Fire Danger In..."
"1956 Forest Fires and Fire Danger In..."
"1957 Forest Fires and Fire Danger In..."
"1958 Forest Fires and Fire Danger In..."
"1959 Forest Fires and Fire Danger In..."
"1960 Forest Fires and Fire Danger In..."
"1961 Forest Fires and Fire Danger In..."
"1962 Forest Fires and Fire Danger In..."
"1963 Forest Fires and Fire Danger In..."
"1964 Forest Fires and Fire Danger In..."
Includes Annual Report, 1957, Southern Forest Experiment Station, Philip A. Brieglieb, director, focus on fire control and the direct effects of fire on the environment, as well as fuels and fire behavior; 1958 at the Southern Forest Experiment Station, Philip A. Brieglieb, director, summarizes SFES' research in fire prevention, causes, and fuel measurement; 1959 at the Southern Forest Experiment Station, Philip A. Brieglieb, director, summary of research at SFES in fire meteorology, predicting fire loads, and prescribed burning; 1960 at the Southern Forest Experiment Station, Philip A. Brieglieb, director, summary of research at SFES includes such topics as the effect of heat on vegetation, the heat resistance of bark, estimating the mortality of fire-damaged trees, and the intersection of rainfall and fire; 1962 at the Southern Forest Experiment Station, summary of research at the SFES includes such topics as drought and fuel moisture, and bark characteristics and fire resistance; 1963 at the Southern Forest Experiment Station, Walter M. Zillgitt, director, summary of research at the SFES includes such topics as fire prevention, mountain fire danger, and the heating of cambium in surface fires. Includes Annual Report 1960, Southeastern Forest Experiment Station, Asheville, NC; Report for 1961, Southeastern Forest Experiment Station, Asheville, NC; 1962 at the Southeastern Forest Experiment Station, Asheville, NC; 1963 Research at the Southeastern Forest Experiment Station, Southeastern Forest Experiment Station, Asheville, NC; Research at the Southern Forest Fire Laboratory, Southeastern Forest Experiment Station, Asheville, NC, October 1961; Annual Report of the Southeastern Forest Experiment Station, 1957, summary of research, forest fire chapter includes information on fire behavior, fire physics, and fire training; Annual Report of the Southeastern Forest Experiment Station, 1958, summary of research, forest fire chapter includes information on estimating drought conditions, fire behavior, the unified fire danger system, aerial fire suppression, and classification of forest fuels; Annual Report of the Southeastern Forest Experiment Station, 1959, summary of research, forest fire chapter includes information on forest fuels, fire behavior, and prescribed burning. Includes photocopy excerpted from Biennial Report of the Southeastern Forest Experiment Station for the Years 1947 and 1948, Station Paper No. 2, summarizes research of the SEFES and includes topics such as better fire protection, use of the new fire danger meter, the comprehensive fire bulletin, and fire prediction; Photocopy excerpted from Biennial Report of the Southeastern Forest Experiment Station for the Years 1949 and 1950, summary of research of the SEFES including such topics as fire protection, fire behavior, fire damage appraisal, fire danger measurement, and fire prediction; Photocopy of excerpt from Annual Report of the Southeastern Forest Experiment Station 1951, E.L. Demmon, director, summarizes research of the SEFES including such topics as fuel moisture, fire behavior, and increased use of fire danger measurements; Photocopy of excerpt from Annual Report of the Southeastern Forest Experiment Station 1952, Station Paper No. 22, E.L. Demmon, director, summarizes research of the SEFES including such topics as the cumulative fire danger index, fire danger stations, and the effects of atmospheric stability on forest fires; Photocopy of excerpt from Annual Report of the Southeastern Forest Experiment Station, 1953, Station Paper No. 34, E.L. Demmon, director, summarizes research of the SEFES including information on the development of a new fire danger meter Type 8-W; Photocopy of excerpt from Annual Report of the Southeastern Forest Experiment Station, 1954, Station Paper No. 50, E.L. Demmon, director, summarizes forest fire research in the area of effect of wind profiles on fire behavior; Photocopy of excerpt from Annual Report of the Southeastern Forest Experiment Station, 1955, E.L. Demmon, director, summarizes research in the application of fire danger measurements; Photocopy of excerpt from Annual Report of the Southeastern Forest Experiment Station, 1956, Joseph F. Pechanec, director, includes research summaries on topics such as the Buckhead Fire, Georgia Fire Problem Analysis, number of fires burned related to burning index, and testing the 8-100-O fire danger meter in the Longleaf-Slash Region; Photocopy of excerpt from Annual Report of the Southeastern Forest Experiment Station, 1961, summary of research contains such topics as fire weather and fire danger measurements, fire models, fire and the environment, sand casting, and prescribed burning. Includes brochure entitled "Joint Fire Science Program," describing the collaboration among the US Forest Service, the Bureau of Indian Affairs, the Bureau of Land Management, the National Park Service, the US Fish and Wildlife Service and the US Geological Survey, established to fill gaps in knowledge about forest fires and fuels, c. 1998; Brochure entitled "Fire and Fire Surrogate Study in the Southern Coastal Plain: Treatments for Fuel Reduction," by the Joint Fire Science Program, no date; Brochure entitled "Managing Fires in Southern Forests: A Look Ahead," Southeastern Forest Experiment Station cooperating with Seaboard Coast Line Railroad Company, Columbia, SC, c. 1971. Includes rough draft of "Burning Index and Relative Fire Occurrence in the Northeast" by A.W. Lindenmuth, Jr. and John J. Keetch, September 14, 1949; Table showing "Normal Burning Index on National Forests of Region 7, based on 1943-1952 data, adjusted to meter 8," revised June 15, 1956, with attached memorandum denoting revision of the normal Burning Index; Excerpt from Journal of Forestry, Volume 57, Number 9, September 1957, criticizing the use of more than two variables to compute the burning index, by William E Reifsnyder, Yale School of Forestry. Includes mortarboard psychrometer templates, bill of materials, specs, USFS Research Paper SE-5 "Mortarboard Psychrometer" by Dee Taylor, 1963, instructions for assembling, notes and letters pertaining to this instrument; List of anemometer suppliers and addresses, March 21, 1946; Letter from John Keetch to "The Files" listing sources and prices for fire danger measuring equipment, May 23, 1946, revised May 1948; Specification for a Fuel Moisture Stick Support Suitable for Use at Open-Type Fire Danger Stations, with Litter Box and Shade Screen Support Plan Suggested by Southeastern Forest Experiment Station on back, March 12, 1958; Bill of Materials and Details of Weighing Shelter [no date]; Specification for Shade Screen Frame and Support for Fuel Moisture Installation at an Open Fire Danger Station, January 29, 1958; Specification for Suggested Ground Plan for Open-Type Fire Danger Station, T.G. Storey, 1956; Proposed Specification for Anemometer, Floating Ball Type, Plastic, April 17, 1963; Handmade untitled calculator by R Nelson showing Burning Index by class day for various Dewpoint temperatures and dry bulb temperatures, April 21, 1954. Includes 1 early Forest Fire Danger Meter issued by the Appalachian Forest Experiment Station, Asheville, NC, July 1937; Example of early Forest Fire Danger Meter for Southern Appalachian Mountains, Meter Type #4, issued by the Appalachian Forest Experiment Station, Asheville, NC, September 1937; Example of early Forest Fire Danger Meter issued by the Appalachian Forest Experiment Station, Asheville, NC, for Piedmont and Coastal Plain, Type #6, February 1938; WV Conservation July 1949 containing 2 articles on fire danger. Includes 1 plastic Burning Index Meter Model 8, issued by the Intermountain Forest and Range Experiment Station, Ogden, UT, 1955. Includes table for Finding the Adjusted Days Since Rain to Us When Precipitation is Recorded at 8:00 A.M., with handwritten label that reads "Central States Meter." Includes Dispatcher's Guide Meter, High Spreading Fuels, 1945; Dispatcher's Guide Meter, Low Spreading Fuels, 1945; Dispatcher's Guide Meter, Extreme Spreading Fuels, 1945; Dispatcher's Guide Meter, Medium Spreading Fuels, 1945; Dispatcher's Guide Meter for estimating fuel moisture, 1945. Includes 1 Lake States Burning Index Meter prepared by the Lake States Forest Experiment Station, University Farm, St. Paul, Minnesota, 1949; Explanation of the Lake States Fire Danger Meter issued by the Lake States Forest Experiment Station, March 15, 1938; "Supplemental Instructions for Using Lake States Burning Index Meter," Revised 1949, May 20, 1949, with cover letter from M.H. Davis to Lake States Forests, March 29, 1949. Includes 2 examples of Longleaf-Slash Pine Forest Fire Danger Meters, issued by Southeastern Forest Experiment Station, Asheville, NC, no date. One annotated "test meter." 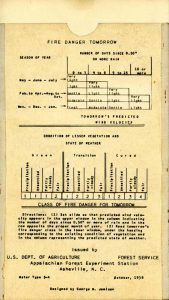 Example of 2 slide-rule type rectangular Longleaf-Slash Pine Fire-Danger Meters issued by Southern Forest Experiment Station, November 1939; Document entitled "Instructions for Dispatchers in Using the Longleaf Slash Pine Fire-Danger Meter," by C.A. Bickford and David Bruce, Southern Forest Experiment Station, November 24, 1939; "Report on the 100-Point Longleaf-Slash Pine Test Meter," by A.W. Lindenmuth, Jr., December 4, 1950. Includes forest fire danger meter Make 3 designed by A. G. McArthur, Canberra, Australia, 1963; Attached letter from A. Hodgson to John Keetch regarding fire danger meter and fire danger tables; Set of Fire Danger Tables, 1962. 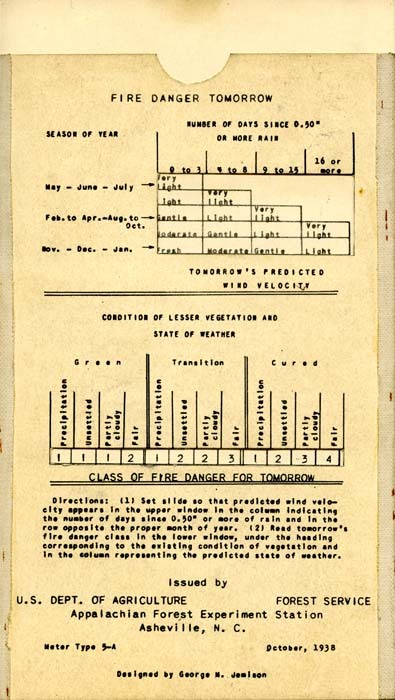 Includes example of J.B. Melin, meteorologist, forest fire danger meter for use in the state of Washington. Includes 1 Forest Fire Danger Meter applicable to brush-covered burns, contains vegetation index, issued by the Northern Rocky Mtn. Forest and Range Experiment Station, Missoula, MT; 1 Forest Fire Danger Meter issued by the Northern Rocky Mtn. Forest and Range Experiment Station, Missoula, MT; "Measurement of Forest Fire Danger Variables in the Northern Rocky Mountain Region," Northern Rocky Mountain Forest and Range Experiment Station, June 10, 1942 with attached Burning Index meter. Includes instructions for Prescribed Burning Indicator D-1 for Southern Coastal Plain; Prescribed Burning Indicator D-1; Page of handwritten notes entitled "Meter Development." Includes 1 Rate of Spread Meter for use in the Southwestern Region, contains Litter Moisture Factor Adjuster, 1954. Includes 1 Forest Fire Danger Meter, Northern Rocky Mountain Region, Missoula, Montana. Includes 1 plastic Spread Index Meter contained in envelope, for use with National Fire Danger Rating System, 1967. Includes 1 Spread Index to Rate of Spread Conversion Meter. Folder Contents: 1 Spread Index to Rate of Spread Conversion Meter for use with the National Fire Danger Rating System in the Intermountain Area, designed by R.J. Barney and W.C. Fischer, 1967. 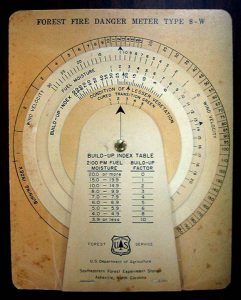 Includes 1 rectangular paperboard Forest Fire Danger Meter Type 5-A, for use in the mountainous regions of the eastern United States, designed by George M. Jemison, October 1938. Includes 2 examples of early rectangular cardboard slide rule type Forest Fire Danger Meters for use in the Mountainous Regions of the Eastern United States. Includes "Report on the Wide Range 100-Point Mountain Test Meter," by A.W. Lindenmuth, Jr., November 7, 1950. Includes 1 forest fire danger meter Type 7, for use in the coastal plain regions of the southeastern United States, designed by George W. Jemison, October 1939; Memorandum for director from George W. Jemison in re: fire danger meter Type 7, August 12, 1939; Example of Forest Fire Danger Meter, Type 7, for use in the Coastal Plain regions of the Southeastern United States, issued by Southeastern Forest Experiment Station, Asheville, NC; "Report on the 100-Point Coastal Plain Test Meter," by A.W. Lindenmuth, Jr., January 3, 1951. Includes 2 examples of Forest Fire Danger Meter Type 8-100-O, issued by the Southeastern Forest Experiment Station in Asheville, North Carolina, one annotated thusly: "Adjusted Meter IME-GILA, use with fuel moisture factors graph." 8.5" x 11" paperboard, 8-100-O System Fire Danger Weather Codes on one side and table of National Fire Danger System codes on the other. Includes 1 Forest Fire Danger Meter Type 8-100-W, October 1954, issued by Southeastern Forest Experiment Station, Asheville, North Carolina. Includes 1 Forest Fire Danger Meter Type 8-O, January 1954, issued by the Southeastern Forest Experiment Station, Asheville, North Carolina; Station Papter No. 33 "Instructions for Using Forest Fire Danger Meter Type 8," by John Keetch, Southeastern Forest Experiment Station, January 1954. Includes 1 Fire Danger Meter Type 8-W, January 1954; Station Papter No. 33 "Instructions for Using Forest Fire Danger Meter Type 8," by John Keetch, Southeastern Forest Experiment Station, January 1954. Includes 1 Forest Fire Danger Meter, Type C-W, issued by Southeastern Forest Experiment Station, Asheville, NC. Back identifies it as, "Mountain Test Meter for use in the Northeastern and Mountainous Sections of the Southeastern United States Where Wind and Fuel Moisture Measurements are Made Under Natural Forest Conditions." The nature of the Forest History Society's archival holdings means that copyright or other information about restrictions may be difficult or even impossible to determine despite reasonable efforts. The Forest History Society claims only physical ownership of most archival materials. [Identification of item],National Fire Danger Rating System Collection, Library and Archives, Forest History Society, Durham, NC, USA. Funding from the National Historical Publications and Records Commission supported the encoding of this finding aid. Support for digitization and outreach provided by the Alvin J. Huss Endowment.